what do you do with a .8cc engine, what do you do with a .8cc engine earl-eye in the marnin’? A recent post by Aperson reminded me of a control-line plane I received for Christmas when I was a boy. I was kind of a plane geek at the time, but I never did get it running, always more interested in my Legos. Every once in a while I would spin the prop with my fingers with a mild curiosity. But as the years went by, I just forgot about it altogether. Some of the parts disappeared, but I knew that I had at least kept the engine just because it was neat. While digging through some old boxes this weekend, I found this! I turns out, not only did I keep the engine, but most of the plane is still with it! 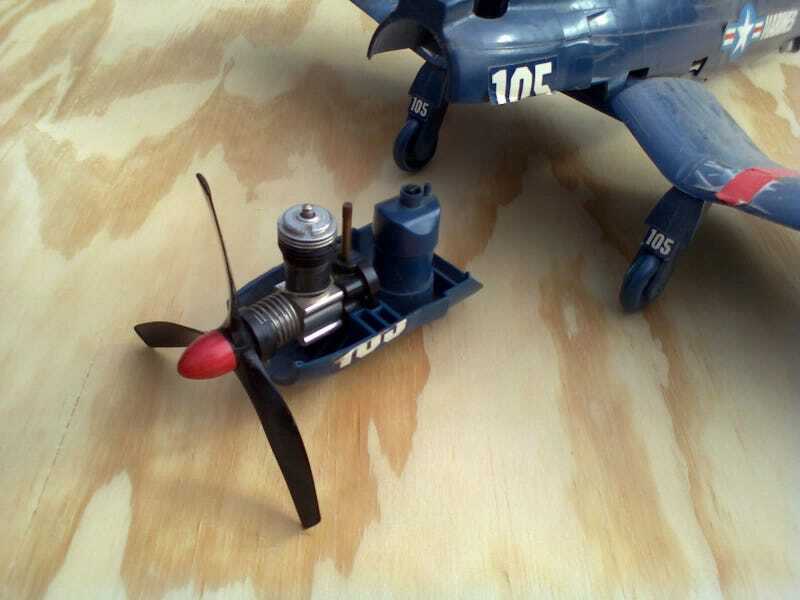 I’ve learned that this 1:27 scale Corsair is made by Cox, and is powered by what Wikipedia identifies as a “late model thick wall cylinder with slit exhaust and a single bypass booster” .049 cu in (.8cc) engine. Now I’ve never been into RC or line-control toys like this, so hobby engines are new territory for me. But I took a close look at it and there’s really not much to it. The fuel tank gravity-feeds to the air inlet. At that point, there is a single fuel adjustment screw, after which it feeds directly into the crankcase, probably to lubricate the bottom end before going to the cylinder. There are passages in the cylinder wall where the mixture can enter the chamber when the piston reaches the bottom of its stroke. Also at the bottom of the stroke are slits in the cylinder wall open to outside air. This must be the “slit exhaust” mentioned in the Wikipedia article. At the top of the cylinder is a glow plug head, but this isn’t a diesel (and it’s certainly not petrol-powered). Apparently it takes “nitro” fuel, which is something I’ll have to find. There is a slight chance that I still have the unopened can of “Super Power Fuel” somewhere around, but I’m not sure it would still be any good. I still have the glow plug wires, but without the battery case, I’ll have to rig up a power source. Now, the fuselage of my Corsair no longer has its rear stabilizer, so I won’t be flying it. But the engine is still “new” and undamaged. I’ll probably throw the rest of the plane in the trash, but this eBay auction gives me hope that the engine might be worth something. Not sure if I want to sell it, though. I want to at least fire it up and... well, I dunno. I thought about a desk toy, but it might be too noisy and messy for that. Any ideas, Oppo?